Peter from Braemar here with an updated fishing report for the week December 17th, well the fishing improved a bit during the past week which was good news for most anglers with bait once again outdoing all other forms, mudeyes have been taken readily by fish at all times of the day and night, the trusty bubble float rig has worked wonders as has casting the mudeye from a fly rod and working it back to shore or the boat, there was a mini hatch of mudeyes once again on Monday night so that has really set up the week and beyond for the fish as they search for mudeyes. Young Sarah Reynoldson from Melbourne caught a beautiful Brown close to 1.5kg and another 2 rainbows about the 800 gms mark using mudeyes under a bubble float when she went fishing with her Dad Wednesday night, Sarah was a bit shy to have her photo taken but well done by outdoing your Dad on this occasion. The Victorians have once again been doing well here at Braemar with Neil Stabb and Warren Davison catching good fish on their outings with local guru Peter Giles, George Smithwick hadn’t bothered got onto the scoreboard at the time of this update but his enthusiasm alone certainly deserved a result. Colin Hall caught a nice Brown one morning using a nymph but once again his efforts were not truly rewarded as with Neil Houlihan who managed the odd fish on Mrs Simpson Hammils Killer and the trusty Red Tag, Steven Fiske also a managed a nice Brown around the 3kg mark apparently so it could be that the fly fishing is starting to get back to where it should be for this time of the year. The trolling improved slightly early in the week with Tassie #’s Y 62 and Y 82 catching quite a few rainbows and 112 catching the Browns, it seems the brighter colours are working best right now trolled in about 5 to 6 meters of water and the #109 proved to be the best darker coloured lure accounting for a few fish early mornings. Chunky Cheese appears to be the preferred power bait right now accounting for quite a few smaller rainbows, but again, mudeyes are the bait to have right now it seems, so call in and get your mudeyes from Mick at The Alpine Angler on your way through. Pictured below is Warren Davison with his 2604 gms Brown and Neil Stabb with his 1882 gms Brown both caught on mudeyes at the front of the Park. We are getting a lot of feed back from the Seven Gates area about fires and rubbish left all over the place. Please be mindful to take your rubbish with you and clean up after yourself. THE TOSSERS ARE BACK. WHY?? 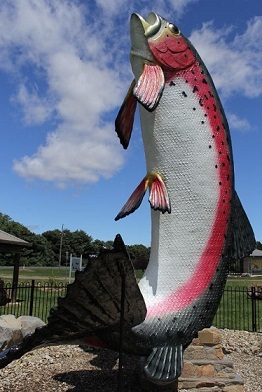 Rivers:- Most rivers are running well and fishing well best areas around Eucumbene river are up higher at Kianda and down at Sawyers most fish have been small with some larger ones coming out late in the afternoons. 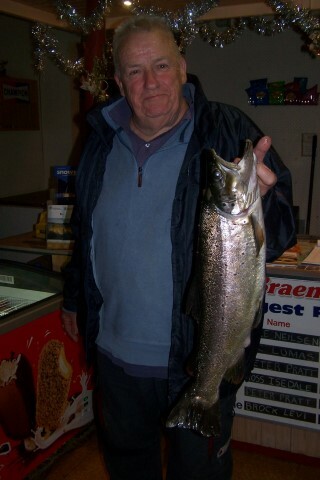 Up at Tantangara fishing has been good in all areas above and below the lake. best flies have been Nymphs and in the afternoons the dry’s are doing the job. Wulff’s , Adams, Stimulators. Most rivers have got fish in them now so do not drive past get out have a look you will be Surprised most rivers have been stocked. Reports have still been good on the Thredbo river with the best reports coming from the top end around Thredbo itself most fish are taking Caddis and Nymphs. Down lower things have Improved with some good fishing around paddy’s and lower past the bridge again Nymphs and Caddis are doing the job unlike Eucumbene river the fish are a lot bigger in the Thredbo. Overall the Thredbo river is fishing well with good rainbows and browns. Do not forget about the other rivers around Jindabyne go for a drive have a look all the rivers are fishing well. 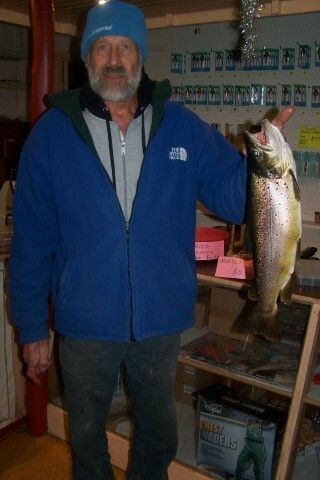 Fishing around the lake has been good with some good rainbows and brown coming in early and late in the afternoons. Early morning fishing is good with the wind staying away till about 9.30am best flies are woolly buggers, Mrs Simpsons, Std Nymphs and Muddlers green, Black. In the afternoons most muddlers are working Stimulator before the sun goes down. Overall Jindy is still fishing well and plenty off fish rising all over the lake. Overall the lake has been fishing well with good numbers coming in rainbows and browns thing will only get better once the mudeye’s come on Christmas is looking good. Jindabyne has been good on both ends of the lake most fish have been taking worms early in the days with the mudeye’s doing the job in the afternoons. Best areas have been hay shed bay, hatchery bay, Kalkite and down at havens bay towards the dam wall. Most reports have been good with most fish in the larger bays as i said worms and mudeye’s are the go. Eucumbene is fishing great with good numbers coming in everywhere still the worms and mudeye’s are doing a lot better then the power bait. Best areas are Middling bank, Frying Pan, seven gates, with Braemar bay doing the best on the mudeye’s. Overall the worms and mudeye’s are going well sorry great!! The fishing is really good and it’s only going to get better by Christmas the lake is high and looking great.